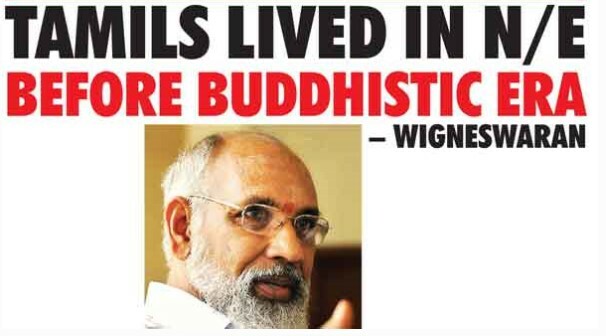 No one seems to have asked Chief Minister Wigneswaran how he came to study at the most prestigious school in Colombo, then went on to become a Supreme Court judge if there was discrimination against Tamils. Most people don’t ask pertinent questions when racist leaders beat their chests with lies. No one has put the NPC Chief Minister on the spot with questions that could easily silence him. Had he been to the North when LTTE was on a killing spree, had he risen against the LTTE when they were kidnapping children and turning them into child soldiers, had he spoken against the LTTE for a wave of crimes perpetrated upon his ‘own people’? Had he even made a single appeal to release the civilians that the LTTE were keeping as hostage or human shields? Had he even challenged the LTTE and Prabakaran though after the killer is dead, Wigneswaran goes on a tangent about the heroics of Prabakaran! To all those that digest his racism and lies let it be said that the NPC Chief Minister was living in Colombo and went to live in the North after 2013, after Prabakaran and LTTE was defeated. 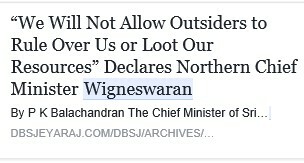 If Prabakaran and LTTE prevailed, there would be no NPC, there would be no CM and Wigneswaran would be still living in Colombo as a retired Supreme Court judge. No wonder he is grateful to Prabakaran, what a lottery for him and without trying to do good especially when his own sons have married Sinhalese, he can only spit venom and hatred and that makes him a great Tamil leader.. how strange! 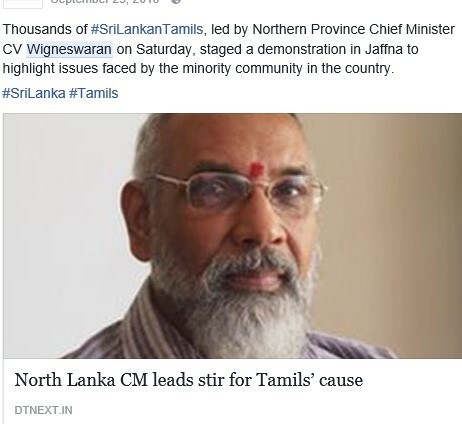 And there are plenty of Wigneswaran’s amongst all of the Tamil leaders and that is why we will never see any peace. It is UN or US which asked Tamils to bickering about genoside. So, Tamils complasing about Genoside chould be to pacify Tamil votrs. that is manipulation and exploitation. Good for us. Tamils rtalkin racism with Foreigners is good for us because they understand that we do anything is to nullfiy racism. We should re asign Armed Forces in the North and East. 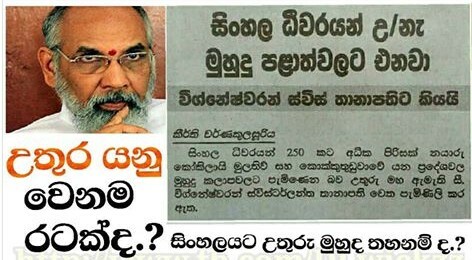 It is this yahapalanaya Government which is in the way of stopping the dirty mouth of Wigneswaran. There should be a change of government without which Sri Lanka is doomed. A change of govt. CANNOT change Viggie. Viggie became CM during MR’s time. MR took oaths and appointed the dirt as CM!! Don’t blame this govt that only INHERITED Viggie in the north, Najeeb in the east, Hirunika in the west and Dayasiri in north-west. ALL Yamapalana or worse crowd. Vigneshwaran should know that Sri Lankan Tamils are decedents of recent immigrants. He should not be allowed to lie about the history and archaeology of this island. Sri Lankan Tamils were only present in the Jaffna peninsula after the Aryachakravarthi invasion which was just prior to the arrival of the Portuguese and even that was a very sparse presence. Present day Sri Lankan Tamils were brought over by the Dutch and the British to work on tobacco and indigo plantations. Therefore they are descendants of recent immigrants. They cannot claim homelands let alone even a province. In fact, the entire island is the homeland of the Sinhala people but today of course, Sri Lanka is multi cultural and that is quite fine and we accept that. Therefore, there should be a strong central government, president etc. with only limited powers provided to provincial councils such as at present and no more powers should be provided to provincial councils. ALL Political Leaders of Sri Lanka MUST be PATRIOTIC TO SRI LANKA ! ALL these Lankan Leaders, whatever their community, were born in Sri Lanka, nurtured and educated in Lanka, received free Health Care and other perks at taxpayer expense (most of the tax payers of Lanka are Others, and not only some Tamils). Otherwise, why call them Sri Lankan Leaders ? Those leaders who are NOT PATRIOTIC to Sri Lanka should leave Lanka and go to a country of their choice where they can be patriotic to that country. Those who like to ‘divide & rule’ Lanka are NOT PATRIOTS. Those leaders who NOT PATRIOTIC ought to be ousted from Parliament. Of course, some of them may be ‘play acting’ to tide over certain shaky times, but they can cause untold harm to the country through their shady deals with foreign countries. The least Mr Wigneswaran could do for Lanka would be to REVOKE in Parliament the Vadukoddai Resolution (1976) which calls for formation of Tamil Eelam using Violence. We could then call him a good Tamil Leader. 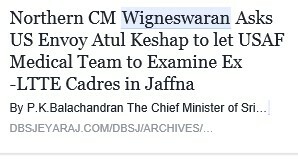 Will Mr Wignesawaran be a PATRIOTIC LEADER of Lanka ? Fastest Breeding Religion’s bada udin, a sad ali (not enough children to be sad? ), kabir hashish, xxxxhim etc. etc. years for their votes sidelining (destroying) Sinhalese race, Sri Lanka and Buddhism. Today the racist tribes are at Sinhalese throats from all sides. Traitor chief Batalande Wandakaya is over the moon since it can see Sri Lanka heading towards an eternal blood bath and with it the end of Sinhalese race, Buddhism and Sri Lanka. existence envied by the whole world? UNPatrioticrats have divided the Sinhalese and have made the minorities king makers in Sri Lanka. from these foreigner racist tribes. Ungrateful …. You know the word we should use there! This entry was posted on Tuesday, April 4th, 2017. You can follow any responses to this entry through the RSS 2.0 feed. You can skip to the end and leave a response.